Do you know a working mum who deserves recognition? DO you know a working mum who deserves more recognition than she actually gets? 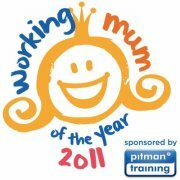 Well Pitman Training have sponsored the Working Mum of the Year Award. DO you know a mum who not only juggles a job/business, family and a house or possibly volunteer for a charity? Well show here how much she is appreciated by nominating her for this amazing award. The prize for the Working Mum of the Year is a Villa holiday with inclusive car hire! Also three runners-up will receive fantastic prizes too! The winner will naturally also be invited to the Awards Dinner at the Royal York Hotel on the 19th November where you will join Olympic Silver medallist Colin Jackson and Fairy Jobmother Hayley Taylor. The panel for this award is Fairy Jobmothr Hayley Taylor,Claire Lister from Pitman Training and Siobhan Freegard co-founder of Netmums. So if you know someone or want to nominate yourself visit here to find out how. This entry was posted on Thursday, October 13th, 2011 at 6:57 am and is filed under Awards. You can follow any responses to this entry through the RSS 2.0 feed. You can leave a response, or trackback from your own site.